This walk at Hengistbury Head started at 11.00 am with around 36 people at the start from the Hiker Café. We were joined at various points on the route by other members of 1020 ending with well over 45 people. The walk was organised by David Cresswell who received a replacement kidney just about one year ago and was his way of saying thank you. We have another member, Barrie Churchill who is waiting for another kidney but was unable to join us due to not feeling well; he sponsored me to do the walk in his place. 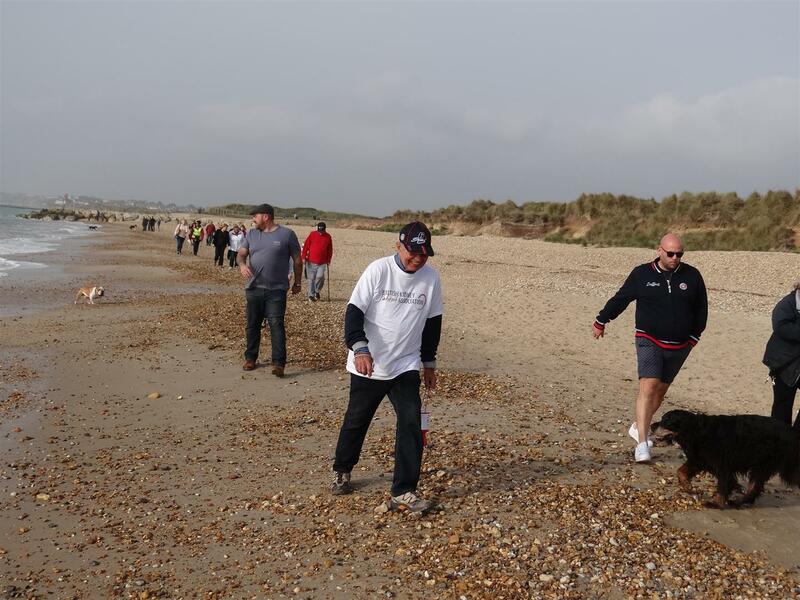 Unfortunately, earlier this year we lost Graham Simms, another member of the club to renal failure; he also was remembered on this walk.Setting off from the Hiker Café, we crossed the first field and dropped down onto the beach; following the tideline all the way round to the beach huts at Mudeford. Coffees and ice creams were the order of the day before re-starting the walk along the much easier tarmac road and returning back to the café. The weather was kind to us and the walk proved to be very enjoyable. Thanks go to the Cresswell family and to all of the 1020 members who turned up on the day. Sponsorships and donations went very well and will be added to the proceeds of our Christmas lunch raffle and the result of an auction of some very good prizes at both the December meeting and the Christmas lunch.